Recommended Citation: Schafer, R J and R J Hammell. 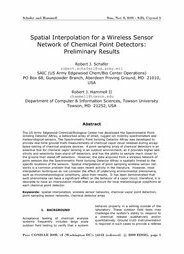 Spatial Interpolation for a Wireless Sensor Network of Chemical Point Detectors: Preliminary Results. In The Proceedings of the Conference on Information Systems Applied Research 2009, v 2 (Washington DC): §4152. ISSN: 0000-0000. The US Army Edgewood Chemical/Biological Center has developed the Spectrometric Point Ionizing Detector ARray, a networked array of small, rugged ion mobility spectrometers and meteorological sensors. The Spectrometric Point Ionizing Detector ARray was developed to provide real-time ground truth measurements of chemical vapor cloud releases during acceptance testing of chemical analysis devices. A point sampling array of chemical detectors is an essential tool for chemical vapor sensing in an outdoor environment, as it provides higher sensitivity and selectivity than stand-off detectors, and has the ability to sample much closer to the ground than stand-off detectors. However, the data acquired from a wireless network of point sensors like the Spectrometric Point Ionizing Detector ARray is spatially limited to the specific locations of the sensors. Spatial interpolation of point sampling wireless sensor networks is a common problem that has seen recent activity in the literature. However, most interpolation techniques do not consider the effect of underlying environmental phenomena, such as micrometeorological conditions, upon their results. It has been demonstrated that such phenomena can have a significant effect on the behavior of a vapor cloud; therefore, it is desirable to have an interpolation model that can account for local meteorological conditions at each chemical point detector.